Luca is the best theme of the Responsive OpenCart 3 Theme Collection, designed for any online market store, mega store, fashion/clothes store, etc. 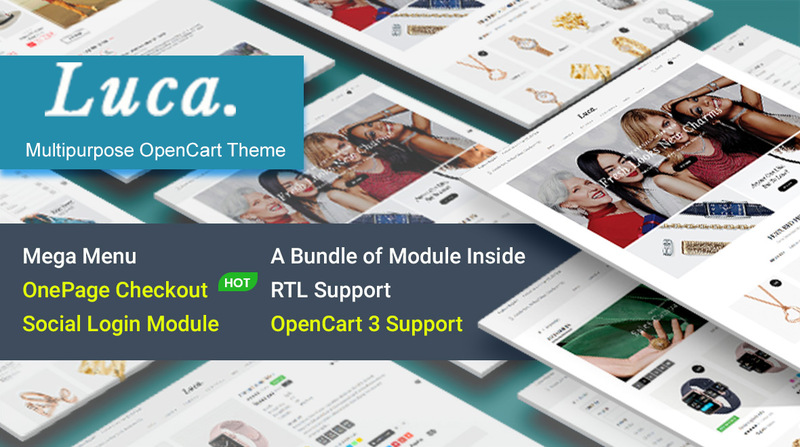 On the trending of OpenCart 3 theme, Luca will definitely satisfy you by its design, function & powerful features. It includes an attractive homepage slider with many smooth effects, multi-language, multi-currency, image popup view and much more. With super fast speed, Luca Fashion – OpenCart 3 theme will enhance the customers’ experiences. Try it now! With just a few clicks, you will see this theme's powerful features! ✔️ Modern Design: Highly responsive, unlimited colors, megamenu built-in, beautiful slider, countdown slider, featured product blocks, product listing tab, etc.